One of the highlights of the opera season in Toronto are the performances by the Canadian Opera Company Ensemble. These are the young singers in training at the COC who move from their comprimario roles in the mainstage productions to star in a production built around their talents. Lately the Ensemble has alternated between modern chamber operas and those of the Baroque, having scored major successes with two by Francesco Cavalli (1602-76), "La Calisto" in 1996 and "Giasone" in 1998. This year the COC Ensemble presents a real rarity, "Giulio Cesare in Egitto" by Antonio Sartorio (1630-80), for what may be the first time in over 300 years. The title, of course, is the same as one of Handel's greatest and most popular operas that the COC will be mounting in April 2002. Few people know that Handel's opera of 1724 is based on a revised version of the libretto originally written for Sartorio. The COC's thoughtful programming allowing patrons to compare the earlier and later works should be enough enticement to see the Sartorio. What audiences will discover is an opera completely different in style and intent from Handel's, fascinating in its own right, beautifully directed and performed. In the fictionalized history of Giacomo Bussani's libretto, Giulio Cesare has pursued his enemy Pompey to Egypt to find him already slain by the Egyptian king Tolomeo in an effort to gain the Roman emperor's favour. The Egyptian general Achilla and the Roman general Curio fall in love with Pompey's widow, Cornelia, but she her son Sesto pledge themselves to vengeance. Even Tolomeo himself based on Achilla's report vows to add Cornelia to his list of conquests. 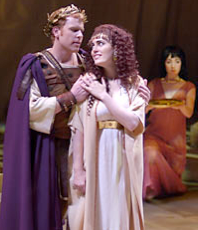 Meanwhile Cleopatra, Tolomeo's sister, plans to make Giulio fall in love with her in an effort to wrest power from her brother and become sole ruler of Egypt. She woos and conquers him disguised as her own serving maid "Lydia". Cornelia's attempt at revenge results in the capture of her and her son, but with the help of Cleopatra's unsightly nurse Rodisbe and her maid Nireno, the two escape, Cornelia disguised as a soldier and Sesto as a woman. An intricate series of plot twists results in the defeat of the tyrant Tolomeo and a double wedding. What suited Sartorio's Venetian audience of 1676 did not suit Handel's London audience of 1724. The ideal of "opera seria" required the elimination of all comic elements. The plot was simplified and most of the multiple disguises removed. While Handel's version is a masterpiece, Sartorio's has its own virtues. Handel's "opere serie" can often seem like stroll through a portrait gallery as we view characters fixed in one pose after another. In Sartorio we feel more as if watching a motion picture. In Handel recitative serves to move us from one pose, or da capo aria, to the next. In Sartorio recitative can shade into arioso before crystallizing briefly in an aria only to dissolve again into recitative. Venetian audiences praised libretti for their intricacy and "brio nell'equivoco". In Sartorio we feel that Cesar's arrival in Egypt is a descent into a world of deception where nothing is what it seems. On its own terms this makes sense of the use of multiple disguises and of the scene that closes the first act where the ancient Rodisbe tries to repair the ravages of time with Cleopatra's makeup. Where Cavalli carnivalizes mythology, Sartorio does the same for history giving the work a comic undercurrent that moves from the mourning of Pompey to the weddings of Giulio and Cornelia after the villain has been trapped in his own net. Director Tom Diamond has taken his lead from Tolomeo's central aria lamenting his subservience to two blind gods, Cupid and Fortune. Diamond has the brilliant idea of showing us that Cleopatra's servants, Nerino and Rodisbe are really those two gods in disguise. This interpretation does not seem forced because Nerino (Cupid) and Rodisbe (Fortune) do perform the roles of intriguer in love and politics, respectively, throughout the opera and their efforts are what help defeat Tolomeo. Diamond at one stroke gives a modern audience insight into the Baroque opera's structure and links it back to gods-in-disguise of his previous productions of Cavalli. The frequent whirling and circles of choreographer Paula Thomson's dance reflect the themes of intrigue and reversals of fortune. Phillip Silver has has created an elegantly simple set of a pentagonal marble floor as a thrust stage and a linen backdrop, both sandy beige, onto which lighting designer Bonnie Beecher projects lines of hieroglyphics and creates a wide range of moods. Wendy White's costumes are appropriate but not quite as witty as the rest of the production. The singers playing Cornelia and Sesto struggle constantly with the unfastenable robe she has given them. As with other Ensemble productions, this "Giulio Cesare" shows what fine young singers Canada has been producing. Roger Honeywell (Giulio Cesare), fending off some hoarseness, has an heroic dark-toned tenor and an acting ability honed both at Stratford and the Shaw festival. His mourning for Pompey and his realization of Cleopatra/Lydia's love are particular high points. Former Ensemble member Krisztina Szabó (Cleopatra) returns to give a magnificent performance. Her mezzo voice has grown so rich and clear and her presence so commanding she is vocally and dramatically seductive throughout. The night I attended the alternate Cornelia, Colleen Skull displayed a powerful, dark soprano, her finely nuanced reading of the music compensating for rather generalized acting. Shannon Mercer (Sesto), a woman playing a boy who then has to play a woman, has a bright, clear soprano and fine acting to bring off this complicated role with panache. Among the other singers, tenor David Pomeroy (Tolomeo) does not yet have the richness of Honeywell, but he delivers Tolomeo's important Act 2 aria about Cupid and Fortune with great dramatic power. Bass Olivier Laquerre (Achilla), effective despite a silly costume and wig, makes a strong impression as does tenor Peter Collins (Curio). Mezzo Andrea Ludwig (Nireno/Amore), sprightly of voice and acting, is a constant delight, while veteran tenor John Kriter (Rodisbe/Fortuna), returning for another Baroque role in drag, is funny in his main scene of Act 1 but is otherwise too distracting. We owe a debt of thanks to the late Peter Sandor, whose Baroque opera Fund has promoted this genre at the COC, and to conductor Gary Thor Wedow, who discovered Sartorio's work among other forgotten 17th-century operas at the Julliard library and recognized its worth. He gives the score an ideal pacing and brings out Sartorio's many contrasts of rhythm and orchestration, from passages of languor or mourning to martial music and the four rousing "trumpet arias". Experts see Sartorio as the link between Cavalli and Handel. Wedow's warm advocacy of the score, the Ensemble's exuberance and Diamond's insightful staging make this a rare gem that will appeal to more just than fans of the Baroque. Photo: Roger Honeywell and Krisztina Szabó. ©2001 Canadian Opera Company.